Acquired cystic disease of the Kidney (ACDK) is a well documented complication of end stage renal failure in patients managed conservatively or supported by dialysis. The aim of the present study is to highlight the scope of the problem among our patients, and to evaluate the clinical characteristics of the disease. A Total of 124 patients with chronic renal failure (106 on dialysis, 18 non-dialyzed) were studied with ultrasonography by the same radiologist. ACDK was defined as the presence of four or more cysts in each kidney. The cysts should have sharp smooth wall with acoustic enhancement. In non-dialyzed patients, 5.5% had ACDK, 33.5% had one to three cysts and 61% had no cysts. Among dialysis patients 42.5% had ACDK, 26% had one to three cysts and 31.1% had no cysts. During of dialysis therapy and age were greater in patients with ACDK (74 ± 30 months. 58 ± 3 years respectively) compared to those with no cysts (11 ± 8 months. 26 ± 4 years). The major clinical complications were intracystic hemorrhage in three cases and stones in seven cases. No correlation was noted between the presence of cysts and the original kidney disease, gender, hematocrit or adequacy of dialysis. We conclude that, ACDK occurs commonly in patients with chronic renal failure; however, patients are generally older and have been on dialysis longer than patients without cysts. Ultrasound, in the hands of an experienced radiologist, is a relatively adequate screening tool for ACDK and its complications. Brescia-Cimino arteriovenous fistulas (AVF) ad synthetic grafts are the usual forms of vascular accesses for hemodialysis. 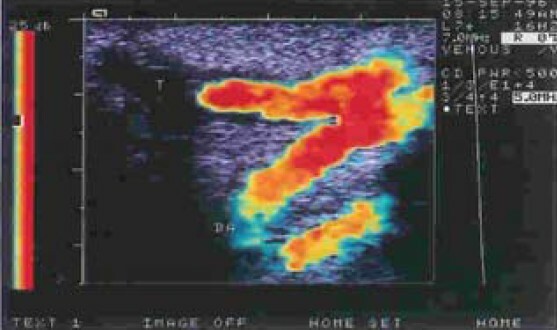 Although angiography has been the traditional means of imaging these vascular systems, colour Doppler flow imaging (CDFI) offers a non-invasive method of evaluating AVF dysfunction. We retrospectively evaluated 22 patients with clinical evidence of access dysfunction who were studied by CDFI and of whom 14 also underwent angiography. We analyzed the results of whom the 14 patients who had both CDFI and angiography as angiography was impossible in the remaining eight patients due to difficulty with cannulation. Eight patient had thrombosis on CDFI and angiopraphy in all eight patients confirmed these findings. CDFI showed six stenoses, all of which were proven on angiopraphy. Overall,, CDFI correctly identified all lesions that were seen angiographically ginging a sensitivity and specifificity of 100%. Moreover, CDFI detected two cases of pseudoaneurysms which were missed by angiography. CDFI provides an adequate means of evaluating AVF dysfunction and should be the initial imaging technique of choice. 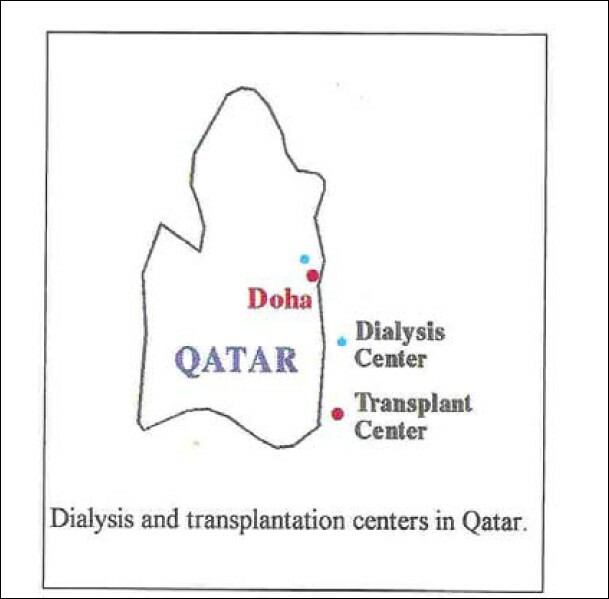 Continuous ambulatory peritoneal dialysis (CAPD) was started at the King Khalid University Hospital in 1986. Peritonitis remains the most significant complication of the procedure. Earlier rates of peritonitis were high, but after gaining sufficient experience, the rates are declining. To evaluate the change in peritonitis trend, 55 new patients who were recruited to our CAPD program between the periods October 1993-October 1996 were analyzed for the development of peritonitis on annual basis. There were 37 (67%) males and 18 (33%) females with a mean age of 43.3 years (range 12-72 years). A total of 34 episodes of peritonitis were recorded with a rate of 1.5 episode/patients year in 1993, 0.5 episode/patient year in 1994 and 0.8 in 1995. only 40% of episodes showed positive cultures whereas 60% remained culture-negative despite use of recommended modified culture techniques. Organisms causing peritonitis included staphylococcus eipdermides (6.7%), E. coli (3.3%), Streptococcus fecalis (3.3%) and pseudomonas (6.7%). Out of 34 episodes of peritonitis, 29 (85.3%) showed response to treatment and five episodes could only be treated after removal of catheter. Of the 29 episodes that responded to treatment, three relapsed and one had recurrent infection . However, all were successfully treated though one responded only after removal of catheter. Thus, a total of six catheters (20%) necessitated removal and replacement. In spite of high diabetic patients population in our series (27.2%) only one died of peritonitis related sepsis and another died of myocardial infarction after clearing the infection. Thus mortality remains low in spite of potential risk. Although we still use straight system CAPD rather than Y system peritonitis rates have declined considerable and we hope that the procedure will gain more acceptability amongst patients with ESRD in Saudi Arabia. A retrospective multicenter study of 38 cases of acute renal failure (ARF) in newborns was carried out from April 1992 to September 1995 in the pediatric department so f a group hospitals of he Royal Medical Services in Jordan, to evaluate the etiology and the mortality rate in the first month of life. ARF was diagnosed according to the urine out put, serum level of creatinine and blood urea nitrogen. Neonatal asphyxia, the most common cause in this study, accounted for 42% (N=16) of renal failure and was associated with the highest mortality rate 70% (N=11). Drugs (aminoglycosides or vancomycin), the second most common cause of renal failure, accounted for 14% (N=7), but no patient sided. Septicemia accounted for 15.7% (N=6) of renal failure; one patients died. Three cases were due to genitorreal anomalies, one died with real agenesis. The other six cases were of different causes, four of them died. None of the newborns was treated by dialysis. We conclude that neonatal asphyxia is the most common cause of ARF in our series, and it carries poor prognosis. However, drug induced ARF has relatively good prognosis. The overall prognosis of ARF in the newborn was rather poor, the cumulative mortality, without dialysis, being of ARF in the newborn was rather poor, the cumulative mortality, without dialysis, being 45% in this study. A review of the angioplasty records between 1990 and 1995 at the King Faisal Specialist Hospital and Research Center, Riyadh, Saudi Arabia revealed ten cases of transplant renal artery stenosis (RAS). The diagnosis in these cases was confirmed by renal angiography and all were treated by angioplasty. All study patients presented with uncontrolled hypertension in spite of multiple medications; eight had renal functional impairment and two patients had recurrent unexplained pulmonary edema in addition. Six patients had undergone end-to-end anastomosis, while four had end-to-side anastomosis of the artery during transplantation. Four had cadaveric renal transplants and six had living donor renal transplants. Eight of these patients responded well to angioplasty with marked improvement in their renal function and reduction in the number of anti-hypertensive medications. In one patient, it was not possible to pass the catheter through the stenosis and the patient underwent surgical reconstruction, while in another patient there were multiple stenotic lesions involving the external iliac and the transplant renal arteries suggesting atherosclerotic changes. We conclude that renal artery stenosis should be suspected in patients after renal transplant if they have uncontrolled or worsening hypertension, unexplained renal impairment or presentation with unexplained recurrent pulmonary edema. Renal angiography should be considered as part of the investigation of hypertension in renal transplant patients, and if the RAS is confirmed, angioplasty should be the procedure of choice. 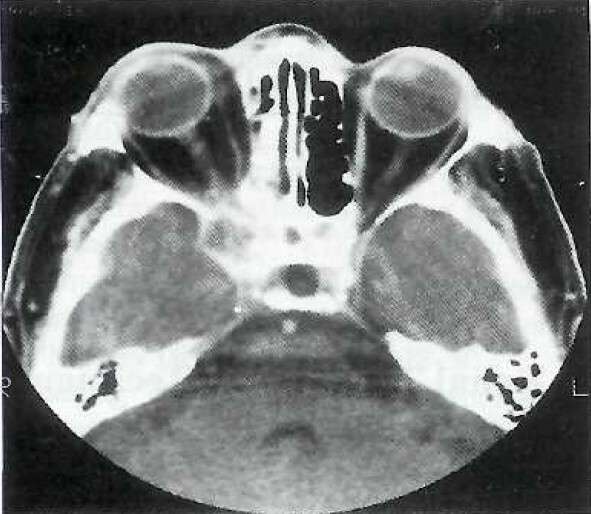 A 57 year-old man presented six months after undergoing renal transplantation with the orbital apex syndrome comprising of retro-orbital pain, visual loss and complete ophthalmoplegia. Pathological examination from the granulomatous-like mass in the apex of the right orbit showed branching hyphae with the characteristic appearance of aspergillus. The differential diagnosis of such a lesion in an immunocompromised patient is discussed. Imperforate hymen is a rare diagnosis in the neonatal period. Bilateral hydronephrosis and renal failure are rare complications of an imperforate hymen. We present the case of a newborn with undiagnosed imperforate hymen complicated with renal failure.